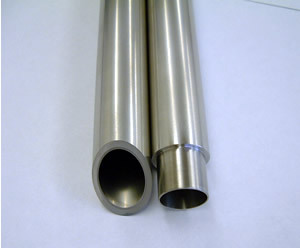 Edgetech Industries LLC provides Zirconium seamless tube (Zr tubes, Zr tubing) & Zirconium pipe (Zr tubes, Zr tubing) with 8-133mm OD and material grades: R60702, R60705. MOQ is for zirconium tube with dimensons we donnot have in stock. Edgetech Industries also provides other zirconium and zirconium alloy products, such as Zirconium rod, Zirconium sheets, Zirconium foil, Zirconium wire, Zirconium flange, Zirconium Pellets, Zirconium Ring, Zirconium Spring, Zirconium plate, Zirconium bar, Zirconium Crucible, Zirconium Flange, Zirconium sputtering targets, Zirconium pipe fittings, other machined and tailor-made zirconium parts. Please send us your inquiry to sales@edge-techind.com for zirconium tubing and other zirconium products. Our zirconium tube are mostly packaged in wooden crate with cushioning material to prevent damage to the material during transportation and handling. Small zirconium tubes are also well packed in cartons.